The latest issue of New York Magazine has a well-researched piece that looks at how cities around the world are combatting rising temperatures and cooling themselves off, including with the use of wind, water and urban greenery. In Manhattan alone, there’s up to 40 square miles of rooftop space, making rooftops a huge source of untapped potential in the fight against city heat. The black asphalt on many New York roofs can reach 190 degrees on a summer day. Through the NYC CoolRoofs program, the city has helped reduce the surface temperature on 6 million square feet of scorching asphalt by using lighter-colored coating that reflects more of the sun’s rays and absorbs less heat. The city plans on keeping apace of a million square feet of new roofing each year. By one estimate, this could ultimately cool New York’s air temperature by about two degrees. And these white roofs undoubtedly help lessen the urban-heat-island effect. They have an ancillary benefit too. Because the rooftops absorb less heat, the internal temperatures of buildings can be significantly lower, cutting down air-conditioning bills and reducing carbon emissions. 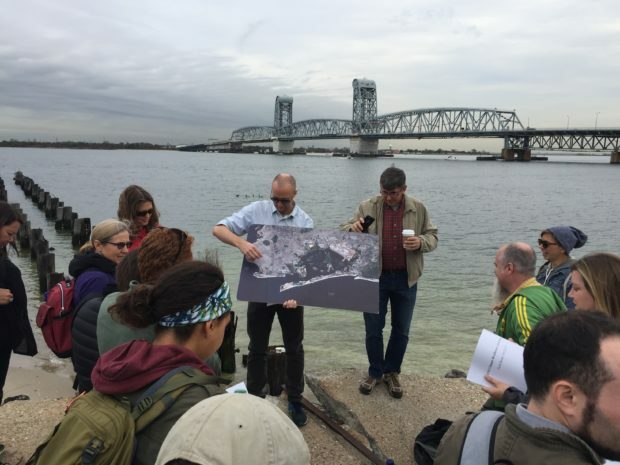 WNYC: Giant Tidal Gates in Jamaica Bay? Could Jamaica Bay flooding best be prevented by a set of giant gates? The U.S. Army Corps of Engineers thinks so, despite opposition by environmentalists. Listen to the audio report from WNYC Radio’s Matthew Schuerman, and read the full story here. Climate adaptation, particularly how to pay for it, was central to negotiations at the recently concluded United Nations summit on climate change in Paris. Policymakers wrestled with the major adaptation issues – not just funding, but also development in urban hubs, crumbling water infrastructure and more. To help follow reactions to the adaptation discussion at the UN summit, as well as how the adaptation debate unfolded, AdaptNY curated key moments from the summit. Read on. One of the organizations frequently at the forefront of New York’s resiliency thinking is the Metropolitan Waterfront Alliance, a non-profit partnership of some 800 NGOs focused on metro-area waterways. Whether with a recently developed set of waterfront resilient building guidelines, or an about-to-be-released analysis of the long-term costs of resiliency, the alliance has delved deep into the complexities of protecting the city’s coastline from the risks of climate change. The alliance holds its annual Waterfront Conference tomorrow, May 7. AdaptNY took the opportunity to interview Roland Lewis, the organization’s president and CEO. Read on, and watch for live Twitter coverage of the event tomorrow on @AdaptNY. AdaptNY: We recently reported on the many open questions around New York’s planning for climate adaptation. How well do you think the de Blasio administration has done on resiliency, and with its recently released OneNYC sustainability plan? How does OneNYC compare to the resiliency plans outlined under the previous Bloomberg administration? Roland Lewis: The mayor’s key policy platform of addressing equity within the overall plan was a welcome addition, and he should be lauded for combining worthy goals to promote both a just and sustainable city. Adding community benefits such as local hiring and workforce development programs, in addition to addressing trash equity issues, have long needed more attention. We do think everyone is looking for more of the details that support the colorful and inspiring vision that they have used to re-launch PlaNYC to OneNYC. The release of the budget [expected May 7] and numbers that support these visions will be telling, and show exactly which projects advance the goals of OneNYC. City officials are far from indifferent. Its strategy, in a nutshell, is to gradually strengthen the coastline, upgrade building stock and protect critical infrastructure. Next week on Earth Day, April 22, the city plans to release a major progress report, the first in four years, on its multi-pronged sustainability framework, known as PlaNYC. As in the past, the report is expected to include discussion of climate resiliency, that is, the city’s ongoing and developing preparations to manage for the effects of climate change. In anticipation of the city’s report, AdaptNY and news partners Gotham Gazette and the NY Environment Report raised a series of key questions about resiliency planning with a group of planners, engineers, architects, elected officials, and other experts. Just over half of the deaths caused by Superstorm Sandy, 22 to be exact, occurred on Staten Island’s East and South shores, as the storm’s waves battered homes and swept some off their foundations. The projects are on target, say local officials, but the pace needs to be faster. The island’s East Shore is directly exposed to the New York Bight, a coastline formation that can channel powerful storm waves and surges into areas within New York Harbor. The U.S. Army Corps of Engineers is planning to construct a “mega” sea wall that will protect over half of the East Shore, from the Verrazano Bridge to Oakwood, said Staten Island Borough President James Oddo in a phone interview. The Army Corps will be releasing a draft feasibility study on the proposed wall to the public next month. Oddo estimated that the wall would be completed by 2020 or 2021. The city and state are also assisting with its construction, he said. What happens between now and 2020 or 2021? Do New Yorkers believe, two years after Superstorm Sandy decimated the area’s coastline, that they’re safer from future storms and devastating floods? City officials we interviewed argue that preparations are underway to protect New York from future climate risk. Yet some local City Council members confirm that the public sentiment we gathered is not misguided, acknowledging that more needs to be done to let New Yorkers know about resiliency efforts. These were the findings of a team of nearly three dozen journalists conducting an investigation that ran several weeks and focused on two of the city’s worst storm-battered communities – Brooklyn’s Red Hook and Manhattan’s Lower East Side. The collaborative reporting project was conducted by AdaptNY, with partners Gotham Gazette, a public watchdog climate news site; the independent NY Environment Report, and the CUNY Graduate School of Journalism. The “Are You Climate Safe?” project sent our reporters into the field earlier in October. There, we interviewed residents and business owners, and subsequently surveyed online dozens of others from these two high-risk neighborhoods and other parts of the city and metro area (see live coverage from Lower East Side and from Red Hook, plus a live reporting wrapup). The overwhelming majority of those we contacted told us they thought they were no safer. Just a handful said they believed they were better off. A significant number also said they were simply unsure what measures, if any, were being taken to protect their communities. That despite the fact the city appears to be working steadily through a massive and costly set of resiliency initiatives, even as it struggles to make progress in responding to disappointment over the slowness of its “Build It Back” housing recovery program. The degree of public disengagement with city planning work on climate resiliency we uncovered echoes our previous investigative findings of a striking disconnect in communication between City Hall and some of the communities most affected by Sandy. “I have not seen any evidence of preparation against climate risk in my community, except for the new NYC flood risk zones map,” said one retired Red Hook resident. “I don’t believe we are truly informed on what has been done,” said another. The collaborative also spoke with city leaders, including City Council Members and high-ranking members of the de Blasio administration. Many of the city’s large-scale climate resiliency projects, still in the planning phase, are essentially invisible to residents we reached. As a result, some prominent local officials argue that there needs to be a “clear, concise, understandable” version of the city’s resiliency plan, especially in these most vulnerable areas. But planning is clearly underway, such as with large-scale flood protection projects in Red Hook and the Lower East Side, both hard hit by Sandy-related flooding. Both communities are also about to see portions of $1.8 billion in FEMA funds for the permanent replacement of temporary boilers, installed after Sandy damage in the public housing complexes that many of their residents call home. Yet many residents, uncertain about broader resiliency measures being put into place by city officials, told us they are preparing personally for another catastrophic weather event. Some, especially in Red Hook, see themselves as more reliant on the efforts of fellow citizens in community groups and local community boards for protection from future climate extremes.